At IJburg there is a club house for 10 clay tennis courts. It is coated completely with EDPM polymer paint and is the work of the MVRDV team of architects. 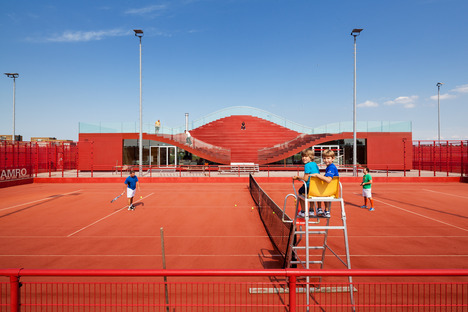 The IJburg district, recently formed in Amsterdam, has about 45,000 inhabitants and its tennis club had no club house worthy of the athletes of every age using the grounds. The 1,100 tennis players who take turns there for 365 days a year, from the snallest to the oldest, needed a better place in which to get together than the meagre grandstand running between the courts. The architects entrusted with the project therefore redesigned it, including inside it all the functions required for the sporting lives of the club members. It is a simple rectangular building with a shaped roof, the straight beams of which are positioned in such a way that they curve the surface of the ceiling. Thanks to this contrivance, the new grandstands can now be housed above the architectural volume. After all, the typical geometrical property of the hyperboloid was exploited. 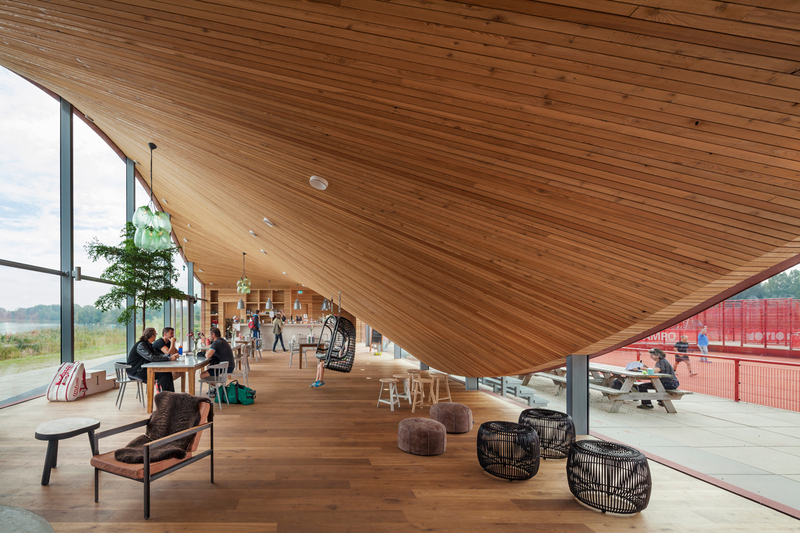 The building is made of reinforced concrete, but the interiors feature selected and FSC (Forest Stwardship Council) certified wood, thus guaranteeing reforestation downstream from where the plants were cut down, according to environmental protection criteria. The outside, on the other hand, has some innovations worthy of consideration, since the architects chose to coat the whole building with a terpolymer. This is an ethylene-propylene based rubber, vulcanisable with a third monomer, giving rise to its acronym: EPDM (Ethylene-Propylene Diene Monomer). It has considerable properties that have little to do with architecture but are usual in the fields of mechanics and car-making. This was an understandable choice since the typical bright colours of plasters tend to fade due to weathering and to UVA rays, due to which constant repainting would be needed in order to maintain the original colours. In this case, instead, the blow of the weather is fought off effectively, thanks also to the good resistance of EDPM to the weather.